Jeera polees or Jeera Polis are special kind of pooris dipped in sugar syrup. Its a great and easy dish for any occasion. Jeera means sugar syrup. Here's the recipe. Mix sugar and water. Add Cardamon powder, Saffron and allow it to boil for 10 mins. Mix Fine Rava and All Purpose Flour (Maida) adding water little by little. Knead well atleast for 5 mins. The dough should be like that of the poori dough consistency. Keep aside for 3 hours. Roll out the dough like pooris and deep fry in oil. Immedietely soak the polee in the prepared Jeera for ten seconds and take it out and arrange on a plate. Please note: PLEASE DO ONE POLEE AT A TIME. DO NOT MAKE POLEES FIRST AND THEN DIP IT IN JEERA. 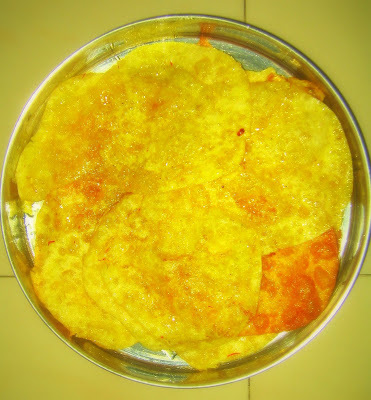 THE POORIS WILL BECOME CRISPY AND WILL START TO BREAK INTO PIECES. Enjoy jeera Polee. This recipe is contributed and photographed by my sister PK. Nice recipe.Thanks for ur sis and for u too..
Asha: Thanks. Do try and let me know how it turned out. This recipe is so very new to me. Gottu try it sometime. I bet my hubby who loves sweets will love this one. usha: Yes, its too tempting. This was contributed by my sister and I want to try this one soon. Seema: Yes, its a treat to the sweet tooth. Try it.